In the Arctic Ocean, sea-ice habitats are undergoing rapid environmental change. Polar cod (Boreogadus saida) is the most abundant fish known to reside under the pack-ice. The under-ice distribution, association with sea-ice habitat properties and origins of polar cod in the central Arctic Ocean, however, are largely unknown. During the RV Polarstern expedition ARK XXVII/3 in the Eurasian Basin in 2012, we used for the first time in Arctic waters a Surface and Under Ice Trawl with an integrated bio-environmental sensor array. Polar cod was ubiquitous throughout the Eurasian Basin with a median abundance of 5000 ind. km−2. The under-ice population consisted of young specimens with a total length between 52 and 140 mm, dominated by 1-year-old fish. Higher fish abundance was associated with thicker ice, higher ice coverage and lower surface salinity, or with higher densities of the ice-amphipod Apherusa glacialis. The fish were in good condition and well fed according to various indices. Back-tracking of the sea-ice indicated that sea-ice sampled in the Amundsen Basin originated from the Laptev Sea coast, while sea-ice sampled in the Nansen Basin originated from the Kara Sea. Assuming that fish were following the ice drift, this suggests that under-ice polar cod distribution in the Eurasian Basin is dependent on the coastal populations where the sea-ice originates. 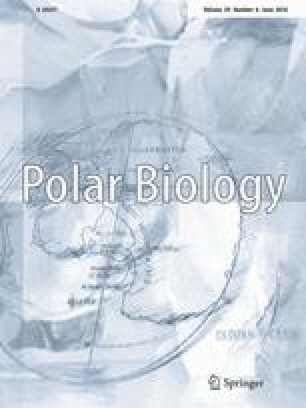 The omnipresence of polar cod in the Eurasian Basin, in a good body condition, suggests that the central Arctic under-ice habitats may constitute a favourable environment for this species survival, a potential vector of genetic exchange and a recruitment source for coastal populations around the Arctic Ocean. This article belongs to the special issue on the “Ecology of Arctic Gadids”, coordinated by Franz Mueter, Jasmine Nahrgang, John Nelson and Jørgen Berge. The online version of this article (doi: 10.1007/s00300-015-1774-0) contains supplementary material, which is available to authorized users. We thank Captain Uwe Pahl and the crew of RV Polarstern expedition IceArc (ARK XXVII/3) for their excellent support with work at sea. We thank Michiel van Dorssen for operational and technical support with the Surface and Under Ice Trawl (SUIT). SUIT was developed by IMARES with support from the Netherlands Ministry of EZ (project WOT-04-009-036) and the Netherlands Polar Program (projects ALW 851.20.011 and 866.13.009). We thank Felipe Oliveira Ribas and Sander Holthuijsen from the Royal Netherlands Institute for Sea Research (NIOZ) for their support in energy content measurements in fish samples. This study is part of the Helmholtz Association Young Investigators Group Iceflux: Ice-ecosystem carbon flux in polar oceans (VH-NG-800). We thank the three anonymous reviewers for their helpful suggestions and comments that contributed significantly to the improvement of the manuscript. This article does not contain any studies with human participants performed by any of the authors or any experimental studies with animals performed by any of the authors. All works were performed according to and within the regulations enforced by the German Animal Welfare Organisation, and no specific permissions were required. The R/V Polarstern is operated by Alfred Wegener Institute and has all necessary authorisation to use trawls to collect animals for scientific purposes. The organisms collected are neither protected nor endangered in the central Arctic waters.